We are a leading Manufacturer of Printed Stationery such as Office Printed Stationery, Continuous Printing Computer Forms, Pre Printed Continuous Stationery and Multi Color Brochure from India. We offer to our clients a wide range of Computer Pre Printed Stationery, which is available in different sizes and paper options. Approx Price: Rs 520 /th. 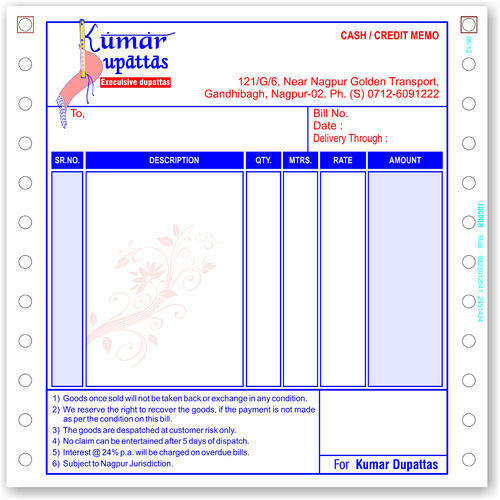 With firm obligation to excellence, we are presenting a world class and a comprehensive compilation of Pre Printed Invoice Printing in Nagpur. Presented services are one of the most preferred selections of patrons due to our punctuality, versatility and reliability. Following the specific necessities, requisites and choices of patrons, we also provide these in altered designs and provisions. We are passionately engaged in offering an exclusive range of Pre Printed Continuous Stationery. These stationary papers are made obtainable in a variety of colors that are extremely appreciated for their features. With the assistance of our talented team of professionals, we have been able to provide a wide range of Printed Stationery. The offered products can be availed by our precious customers as per their specific needs and demands. Leveraging upon our enormous industry proficiency, we are offering quality-approved Printed Booklets. Our patrons can have this product in diverse customized options on their exact necessities.